You should know that CouponAddon is just one more adware application that deceives frequent online shoppers into installing it. It promises to display special offers, discount deals, and coupons that will save you money while shopping online. In reality, CouponAddon is a browser add-on that will flood your browser with useless third-party commercial adverts. You will not save any money by using this application. Even worse is that CouponAddon is linked to various internet-based infections. Thus, by running this program on your PC you risk getting your system infected. 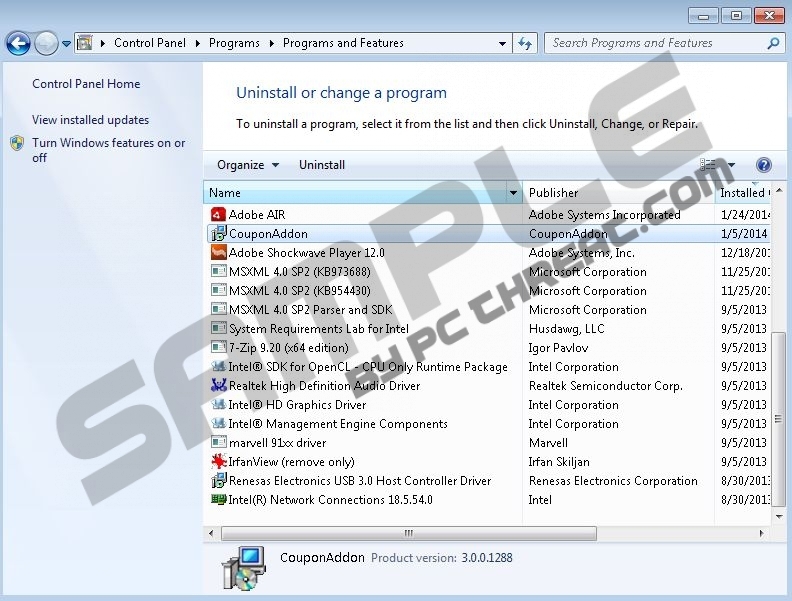 Removal of CouponAddon is a must if clean and secure operating system is important to you. The report provides virtual security tips and a comprehensive removal guide. Since CouponAddon is based on the JustPlugIt engine so it works in a very similar way as other suspicious applications based on it such as RemoveAdsTube, SaverOn, Les2Pay, ExstraCoupon, LuckyCoupon, and many others. Once CouponAddon enters your operating system it installs browser extensions to Mozilla Firefox, Internet Explorer, and Google Chrome. These extensions are used to display third-party commercial adverts within your browser. They will appear randomly whether you like it or not. The only way to stop this annoying activity is to remove CouponAddon from your PC. Unfortunately, the annoyance and frustrations caused by CouponAddon is not the worst thing about it. It was observed to same third-party adverts provided by CouponAddon contain redirect links to suspicious websites. It is possible that just by clicking on such ad you could land on a corrupted website. It could be created by malware distributors to insert your PC with an infection. The majority of corrupted websites are running an arbitrary code execution exploit meaning that your system could be inserted with any malware without needing any authorization from you. It could be very dangerous. Your system could be infected with Trojans, rootkits, keylogger or any other dangerous internet-based infection. CouponAddon is not only similar to other application based on the JustPlugIt engine in a way it works but also in a way it is distributed. Just like most of its counterparts CouponAddon is mostly spread via InstallRex, Amonetize, and Vittalia installers. These installers are usually promoted on fake download website or websites linked to online piracy. Do not get fooled by various offers to download free software as most likely you will obtain a dubious installer filled with unknown and potentially malicious applications. It is advisable to install a reliable antimalware tool to lower the risk of getting your system infected with unknown malware as such tool will provide overall real-time security for your PC. The removal process is relatively simple as CouponAddon can be uninstalled via Control Panel. It is important to mark that it is possible that some traces of the infection remained on your PC. That is why you are advised to check your system for any potential leftovers. A provided list of files, folders, and registry entries related to CouponAddon is provided and should be used as a guide while analyzing your system for leftovers. Select CouponAddon and click Uninstall. Tap Windows key+R on your keyboard simultaneously. Double-click CouponAddon to remove it. Select and remove CouponAddon from your system. Quick & tested solution for CouponAddon removal.